Style Notes: Small batch varietal hard cider. Primary apple is the Reine de Pomme, blended with Dabinett and Redfield. Makers Fruit Notes: “Reine de Pomme is an archaic French Apple. We found it in the Geneva Reference Orchard. In 1987, in France, the only reference to it we found was a listing in a nursery catalog from the 1920’s at an apple museum in Normandy. No one seemed to know of it. But, forgotten or not, we were struck by the taste- tannins and iron- that made it inedible, but intriguing for a cider. As a cider it has a deep, dark-fruit, honeyed taste. We blended it with our Dabinet to round out the tannins, and Redfield to add bright fruit and to balance the bitter-sweets. Though blended, Reine de Pomme leads the taste, and the Dabinet and Redfield fall in nicely as supports. It is the fullest-bodied cider we have made. And the closest in taste to a French Cider”. 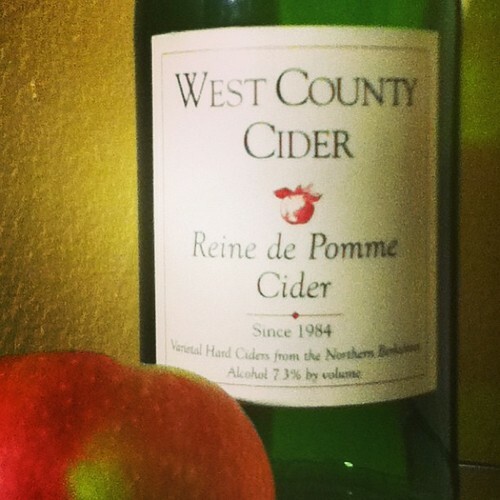 Bottle Notes: The Reine de Pomme – ‘Queen of Apples’ is a classic French ‘bittersweet’ apple. The strong tannins give complexity to this cider. This cider stands up well to robust tastes at the table. Dry. Tasting Notes – In The Glass: Pale, clear, and bright rose gold. Tiny surface beads. Some legs/tears. Sweet dessert apple, sous bois, malted sugar, vanilla, tropical fruit, pineapple, ‘bright’ green notes of pepper and grass. Some leather, hints of spice, white pepper, and wood. Iron. Long tannic finish with medium acidity. Winey with a light, silky, smooth mouth feel. Our Pairings – The Tasting Lab: This queen becomes humble when matched with food, elevating the flavors in the food to heights beyond her own. As a supporting player she does her best work with intense aromatics (garlic, lemon zest, oregano) but we found little that enhanced her own qualities or produced a completely new experience through pairing. Cheesemonger’s Notes: We tasted this with St. Nectaire which brought out a caramel note that was undetected in the cider on its own or with our other flavor pairings. Other fairly mild washed rinds would probably produce the same delicious effect. Consider Hudson Red or Rougette. Overall Impressions: Another beauty pageant contestant this pretty in golden pink cider boasts a powerfully sweet aroma that is perfectly balanced by complex tannins and bitter flavor elements. Pair with zesty Mediterranean dishes for a regal match or enjoy Reine de Pomme on its own to appreciate her unique variety of flavor notes. Cider52: A Cider A Week. The plan: 52 weeks, 52 cider tastings, pairings, reviews, and postings. Maley Cidre du St Bernard Cidro from the Valle d’Aosta region. Apples used in this cider are from Italian AND French orchards. Cider52: Northwest Cider: Tieton Cider Works, and more American Cider Reviews. It’s week 8 of 2013 The Year of Cider, and our plan – Cider52: A Cider A Week, is on schedule. 8 cider reviews posted, and more on the way. We vow this Presidents’ Day to Drink More American Craft Cider. First up, ciders from Tieton Cider Works in the Yakima Valley of Washington state. Read more about Tieton and Harmony Orchards cider apples. Harmony Orchards is profiled in Rowan Jacobsen’s book, American Terroir. Tieton Cider Works produce 10 ciders, and we will be tasting and reviewing nine, (Precipice Perry Pear Cider is currently not available). American Cider Drinkers Take Note: Tieton Cider Works now ships to 40 US States. 2013 The Year of Cider, Cider52, Hello Cider!